The Madhya Pradesh Leg of Startup India Yatra will begin on July 16, said an officia release on Wednesday. Prior to Madhya Pradesh, the Yatra had travelled to the States of Gujarat, Uttar Pradesh, Odisha and Uttarakhand. Under the programme, a vehicle, with experts on board, will provide an opportunity for entrepreneurial talents to pitch an idea and get incubated, scaling it from idea to enterprise. TheYatra will cover 10 districts and 15 institutions over a span of 30 days. Startup India Yatra aims to scout grass root level entrepreneurs in the smaller towns of India, providing a platform for budding entrepreneurs to realize their Startup dream. 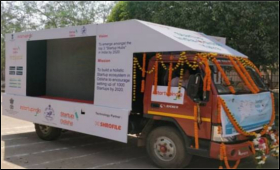 Startup India Yatra’s technology partner, Shrofile, a video-based personality evaluation platform headquartered in Gurugram, will record ideas of entrepreneurs from Madhya Pradesh via the Startup India mobile van. Entrepreneurs will record their ideas on the Startup India App screens, which will be shared with the Startup India team for evaluation and selection.